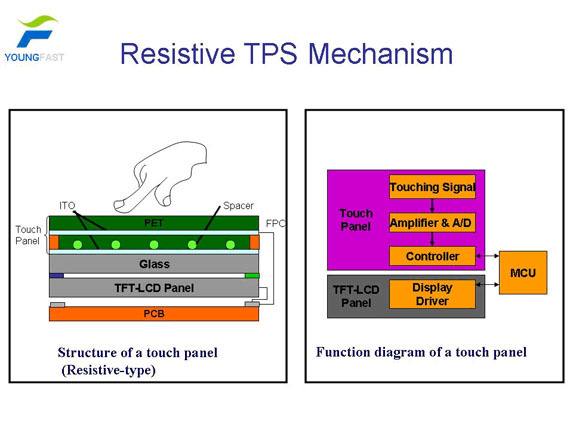 Resistive touch panels are the most common type of touch screen. They are made up of two transparent layers of ITO film and ITO glass separated by dot spacers. When the user touches the screen, the upper film and lower layer of ITO glass come into contact generating a signal that identifies the coordinates of the touch relative to the screen image. Young Fast’s resistive touch panels are high-quality and lightweight TPS solutions that feature input resolution and transmissivity. These touch panels allow easy finger and pen input and operation, providing a quality interactive user interface for any function. Additionally, these TPS solutions support unprecedented durability and reliability, a major contributing factor to end user experience and satisfaction. Today, Young Fast’s resistive panels are widely used for various applications such as mobile phones, PDAs, and GPS navigation devices. Suitable for consumer electronic devices such as PDAs, hand-held game devices, electronic dictionaries, car navigation systems, etc.